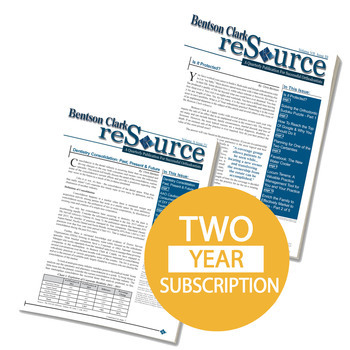 This is 2-year subscription to the Bentson Copple reSource. The reSource is an all-in-one informational source that provides and analyzes real data from real practices to present the most accurate information available within the orthodontic industry. Each issue of the Bentson Copple reSource includes articles written by the most distinguished consultants, industry insiders and businesses leaders within the world of orthodontics. From marketing advice to financial insights, the Bentson Copple reSource focuses on the topics that are important to today's orthodontists, their practices and their future endeavors. The Bentson Copple reSource is solely business oriented and does not include clinical information. It is the only quarterly newsletter written exclusively for orthodontists. To learn more, read a past edition of the Bentson Copple reSource or view a list of all previously featured articles and writers visit, the official Bentson Copple reSource webpage.